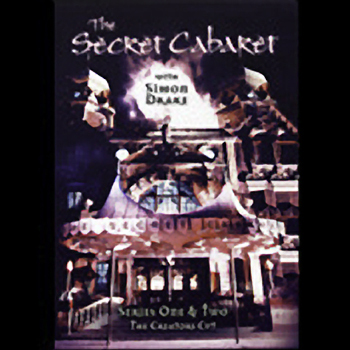 Secret Cabaret DVD with Simon Drake. The Creators Cut Series One and Two. Simon Drake was the first to perform this type of ghoulish horror magic. These are the best bits involving Simon Drake during Series One and Two. 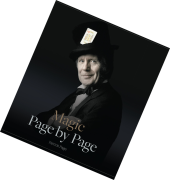 Patrick Page was the Magic Consultant for the Channel 4 TV Series. This is a DVD of Series One and Two – The Creators Cut of the legendary Channel 4 TV series with Simon Drake. Patrick Page was the Magic Consultant for the TV series and even has a cameo performance in one of the scenes as a tramp. Patrick was very proud of the fact that he used his own raincoat for that scene. Exactly…………. For reasons of copyright it was never possible to get the permission of everyone who performed in the series and so a DVD was never created including all the performers. This DVD was created by Simon Drake and includes the parts where he performed. If you are looking for ghoulish and clever horror magic, you will not find better than this. It was the first of its kind and has many imitations. But this is the original – and of course the best. The product price includes worldwide shipping. We aim to ship the next business day. The DVD is a PAL DVD. No other version exists. It can be played on most Mac or PC computers and contains material only accessible from a computer. Payment via paypal in Sterling – £15.50 inclusive of shipping (approx US $20.5).